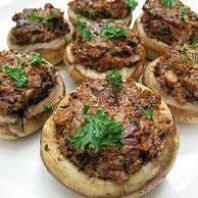 My niece Kellie has inspired me to find out all I can about stuffed mushrooms. Here goes nothing. 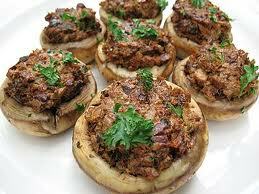 It seems that everybody has a recipe for stuffed mushrooms. They come in small, for hors-d’oeuvres, medium sized, for side dishes and large for main courses. 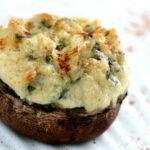 Mushrooms can be stuffed with just about anything from meat to veggies or any combination there of. They can be grilled, baked, pan-fried, sauteed, roasted or any other way that sounds good to you. Mushrooms have a subtle flavor (most that we cook with anyway) and a great texture and mouth feel. They are sponge like and absorb liquid easily. There are a couple of things you night need to know about mushrooms to make good cooking decisions and some information that is just fun to know. shrooms are sponge like and should be marinated or coated in liquid before cooking to keep from drying out. Becareful not to marinate too long (no more than a few minutes should do) or you’ll have a soggy, dense mushroom. Taste the marinade before using to insure it isn’t too strong. With mushrooms, what you taste is what you get. You should never wash mushrooms, just brush off the dirt. If you just have to wash them wait until you are about to cook them then pat them dry. Store in a cool, dry, dark place. Do not cover in plastic or put in a plastic bag. Wrap in a cloth,cheese-cloth, or store in a cloth bag or use them soon after purchase. Saute is great for small button sized or chopped mushrooms. Saute in butter or olive oil and season while cooking. No marinating is necessary but pickled mushrooms saute nicely and are a great addition to a stew or stir fry. Grilling or Broiling in the oven – These methods are best suited to larger whole mushrooms or caps such as Portabellas and Shiitakes. Brush the shrooms with oil or butter and season. Grill or Broil close to the heat source for 4 minutes per side flipping once or twice. Baste a couple of times with your seasoned butter or oil mixture while cooking. Roasting – Preheat your oven to 450°, brush mushrooms as with the grilling method and roast in a shallow pan for up to 20 mins, flipping once. Olive oil, seasoned with herbs and or vinegar is nice. Sherry or other cooking wines make a good marinade. Sauces, such as brown sauce, white sauce or tomato sauce are a great way to raise the flavor profile. Try your favorite salad dressing, like Italian or ranch. Roasting in foil – wrap your stuffed mushrooms in foil and put on the grill for 30 mins or until they seem done. This is best if you have a cheese topping or stuffing that shouldn’t brown too quickly. 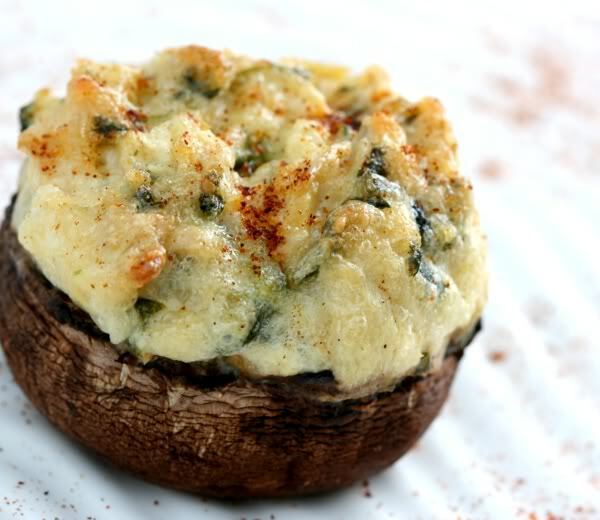 Pan frying/steaming – For smaller stuffed mushrooms fill a frying pan with the stuffed mushrooms and fry on med/high heat in a little oil until the bottoms start to brown. Pour in a 1/2 cup of wine, balsamic vinegar, soy sauce or a combination and cover with a tight fitting lid, reducing the heat to med and steam in the liquid for 10 or 15 mins. This is also a good way to melt a cheese topping.